The Honeywell PrintPAD offers a comfortable printing solution for mobile workers, since it combines handheld mobile devices with a robust 4-inch printer. 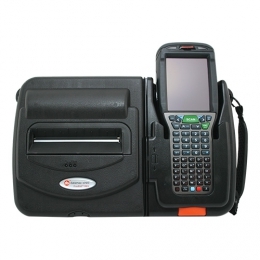 The integrated printing solution supports various common mobile terminals. Its practicability is attractive, since the PrintPAD may also be seamlessly integrated into existing structures - which minimizes acquisition costs and simplifies daily work processes. Whether used as a portable solution or stationary in a vehicle - with the PrintPAD users communicate and print in real-time. The result increased productivity in logistics, maintenance tasks and on-site services of field technicians. With the printing system both the mobile printer and the mobile terminal may be comfortably loaded in one step, including the AC adapter, and users have the practical feature of easily taking an integrated package with them. The robust printer produces tickets and receipts with widths up to 112 mm at the push of a button. Weighing approximately just 1.6 kg including MDC it is lightweight and portable. Clever options, such as Bluetooth and a DEX connection additionally simplify communication with the host system.